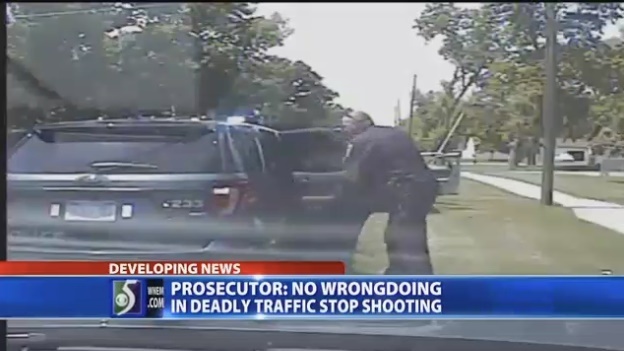 The Saginaw County (MI) Prosecutor’s Office has ruled there was no criminal wrongdoing on the part of two police officers in connection with a traffic stop turned shooting that left a man dead. The prosecutor's office also released dash-cam video and audio of the incident. It happened on Wednesday, July 19, when Saginaw Township officers stopped a vehicle driven by 38-year-old Farhad Jabbari. Jabbari was stopped on suspicion of drunk driving and after field sobriety tests and a preliminary breath test, the suspect appeared to be highly intoxicated, investigators reported. Jabbari was arrested and placed in the back of a squad car. As officers began to fill out paperwork, one realized Jabbari was tampering with his handcuffs, freeing one hand from the restraint. "The suspect slipped his handcuffs from behind of him to the front of him. So the officer and another officer opened the rear door of the patrol car," Saginaw Township Police Chief Don Pussehl said. Michigan State Police report Jabbari began assaulting the officer when he attempted to restrain him. Investigators said Jabbari gouged at the officer's eyes and a struggle ensued near the rear of the police vehicle. A second officer was also on scene and immediately tried to help in restraining Jabbari. Michigan State Police said within only two to three seconds of opening the passenger door of the police vehicle, several shots were fired and the second officer was hit, as well as the suspect. Jabbari was pronounced dead at the scene. Investigators said during the struggle, the arresting officer shot the suspect multiple times, resulting in his death. One of the bullets fired by the arresting officer struck the second officer in the upper arm. The bullet went through his bicep and out the other side, WNEM TV reports.